This best-selling book is the “bible” for families caring for people with Alzheimer disease. The book is ranked the number one best seller in three categories on Amazon: Alzheimer’s disease, Caregiving, and Eldercare. It carries a five star review from customers. 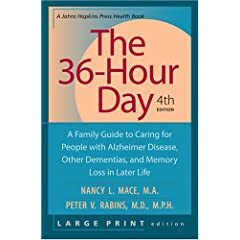 In addition to the practical and compassionate guidance that have made The 36-Hour Day invaluable to caregivers, the fourth edition includes new information on medical research and the delivery of care. new information on diagnostic evaluation-resources for families and adult children who care for people with dementia-updated legal and financial information-the latest information on nursing homes and other communal living arrangements-new information on research, medications, and the biological causes and effects of dementia. 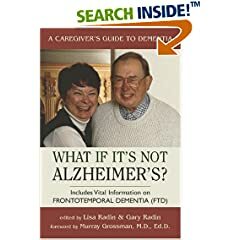 This book has been the single most helpful tool my family has been given to help us help my mother as she progresses with Alzheimer’s Disease. While other books have touched on many of the topics in this book, no where else have we found as much practical information on how to avoid confrontations with her; ways to improve her daily living; ideas to keep her involved with us and to provide meaning to her life; questions to ask her doctors; types of resources that are available (depending on your area); what to expect as the disease progresses; and how to help each other as we take on the many different roles needed to provide care for her. I highly recommend this book to others; in fact, I have purchased multiple copies to share with family members and donate to my local library – that’s how helpful and important this book is! This is a excellent book and reference for those learning to deal with Alzheimer. Plenty of resources and ideas of what to look for when caring for someone with this disease. You can get a good idea of what to expect and how to help those suffering with this devastating disease. Easy to understand and read. Can’t recommend this book enough. This best-selling book is the “bible” for families caring for people with Alzheimer disease…offering comfort and support to millions worldwide. In addition to the practical and compassionate guidance that have made The 36-Hour Day invaluable to caregivers, the fourth edition is the only edition currently available that includes new information on medical research and the delivery of care. You might get the impression from the title that this book is only for professionals; this is not the case. The validation theory works and it is simple to apply. The case studies are invaluable and provide you with specific situations that you are sure to encounter. 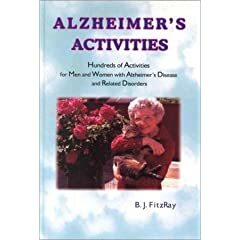 I am convinced everyone involved with elderly parents suffering from dementia or Alzheimer’s will benefit from by reading and utilizing this book. This book contains valuable techniques that are designed to help you communicate more effectively with your loved one. Once perfected you will be able to put away those feelings of frustration and helplessness. Importantly, the learned techniques will help you reduce stress. 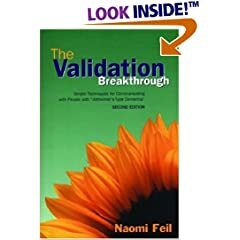 I give The Validation Breakthrough five stars and it is on my must read list. Please take a moment to read the reviews on the next page. If you live with or care for someone with Alzheimer’s or other age related dementia, you must read this book ! What an eye-opener! For the first time I finally understood why Alzheimer’s patient say what they say and do what they do. It all makes so much sense now. This small book reads quickly and is full of examples of real people who have been helped with the author’s techniques. It shows you how to handle the blaming, accusing, name-calling and the repetitive motions … It also explains why the way most of us react to Alzheimer’s patients actions actually worsens the situation and can cause them to progress to a more advanced stage of Alzheimer’s disease ! This book could extend the relationship between the patient and caregivers and should be MANDATORY reading for all staff working in nursing homes and long-term care facilities ! An excellent book for both the professional caregiver and families trying to deal with this sometimes unfathomable disease. Gives practical ideas and techniques for helping people with dementia deal with issues from paranoia and blaming to sadness and helplessness. I have just begun to explore these techniques and am finding they work so well that they should be mandatory training for nurses, PCAs and CNAs. Instead of treating our seniors like they are children we at last have a way to talk to them on an adult level, tap into where they are at, deal with the problem at hand and we all come out better for the experience. You might get the impression from the title that this book is only for professionals; this is not the case. The validation theory works and it is simple to apply. The case studies are invaluable and provide you with specific situations that you are sure to encounter. I am convinced everyone involved with elderly parents suffering from dementia or Alzheimer’s will benefit greatly from this book. I give The Validation Breakthrough five stars and put it on my must read list. You will certainly reduce stress by learning these techniques. Overall, 42% of patients on Flurizan showed improvement or no decline in one or more of the three primary endpoints of cognition, global function and activities of daily living, compared to 10% of patients on placebo. SALT LAKE CITY, UT, March 05, 2007—Myriad Genetics, Inc. (NASDAQ: MYGN) (www.myriad.com) announced today that it presented additional results of its completed Phase 2 follow-on study of Flurizan™ in patients with mild Alzheimer’s disease at the annual meeting of the American Association for Geriatric Psychiatry (AAGP), held March 1-4, 2007 in New Orleans. The data indicate that Flurizan may be capable, not only of slowing the decline of Alzheimer’s disease, but of halting the disease in its tracks. In this study, many patients with Alzheimer’s disease got no worse over two full years, and in some cases, patients treated with Flurizan appear to have improved. At 24 months, study participants in the Phase 2 trial with mild Alzheimer’s disease taking 800 mg twice daily Flurizan experienced a 67% improvement in their level of cognitive decline compared with placebo, as measured by the Mini Mental State Exam (MMSE) score. This difference was highly significant statistically (p=0.001). Additionally, based upon the MMSE score, three times the percentage of patients on Flurizan demonstrated improvement in cognition or zero decline, compared to patients on placebo: Forty-two percent of patients on 800 mg twice daily Flurizan experienced improvement or zero decline, compared with 14% of patients taking placebo. MMSE is the primary test used by most clinicians to help diagnose, assess and monitor progression of patients with Alzheimer’s disease. It was also the principal criterion for selecting patients to enroll in the Phase 2 study, and is a secondary endpoint in the two ongoing Phase 3 trials of Flurizan. Overall, 42% of patients on Flurizan showed improvement or no decline in one or more of the three primary endpoints of cognition, global function and activities of daily living, compared to 10% of patients on placebo. On the test that measures cognition, ADAS-cog, 25% of study participants taking 800 mg BID of Flurizan showed cognitive improvement or experienced zero decline in cognition after 24 months, compared with none on placebo. With the CDR-sb test, a measure of overall function in Alzheimer’s patients, 29% of study participants on Flurizan experienced an improved or zero decline score, compared with none of those on placebo. To recap the efficacy results of the Phase 2 study at month 24 presented earlier, mild patients taking 800 mg of Flurizan twice daily had an effect size of 72%, with a statistically significant value of p=0.0005, as measured by their global function on the CDR-sb test. In activities of daily living, the patients showed a statistically significant 67% effect size (p=0.015). Cognition improvement showed an effect size of 52% at 24 months on the ADAS-cog scale. These data suggest that there is a substantial benefit from Flurizan. The additional data presented at the AAGP meeting and announced today add detail to these effect sizes by demonstrating that, not only did the population as a whole respond to the treatment, but a meaningful portion of the patients who responded to the treatment did so by experiencing either zero decline after two years or a reversal of their decline to actual improvement, something that is very rare in Alzheimer’s disease. Comparisons to placebo at 24 months refer to the placebo group as originally randomized. The vast majority of patients in this Phase 2 study, approximately 94% at the time of enrollment, were receiving stable doses of acetylcholinesterase inhibitors, which are FDA-approved drugs for symptomatic treatment of Alzheimer’s disease. Thus, the benefits of Flurizan observed in these patients were over and above the current standard of care. Myriad has two Phase 3 trials of Flurizan ongoing in patients with mild Alzheimer’s disease. In each study, participants are taking 800 mg of Flurizan or placebo twice daily, and the last participant enrolled will have taken the study drug for 18 months. Flurizan is the first in a new class of drug candidates known as Selective Amyloid beta-42 Lowering Agents (SALAs). Flurizan lowered levels of Abeta42 in cellular assays and animal models. Abeta42 is the primary constituent of senile plaque that accumulates in the brain of patients with Alzheimer’s disease. It is thought to be the key initiator of Alzheimer’s disease, since Abeta42 has the greatest tendency to aggregate, cause neuronal damage and initiate amyloid deposits in the brain. Most genetic mutations that cause early-onset Alzheimer’s disease appear to do so by increasing production of Abeta42. Myriad believes that Flurizan is the most advanced drug candidate that modifies the production of Abeta42 to be evaluated in a clinical trial for the treatment of Alzheimer’s disease. Myriad Genetics, Inc. is a biopharmaceutical company focused on the development and marketing of novel healthcare products. The Company develops and markets molecular diagnostic products, and is developing and intends to market therapeutic products. Myriad’s news and other information are available on the Company’s Web site at http://www.myriad.com. Flurizan is a trademark of Myriad Genetics, Inc. in the United States and other countries. This press release contains “forward-looking statements” within the meaning of the Private Securities Litigation Reform Act of 1995. These forward-looking statements include: the capacity of Flurizan to not only slow the decline of Alzheimer’s disease, but halt the disease in its tracks; the suggestion that patients on Flurizan with Alzheimer’s disease will get no worse, and in some cases reverse the course of the disease, resulting in patient improvement; the showing of improvement or no decline of patients on Flurizan on one or more of the three primary endpoints of cognition, global function and activities of daily living; the suggestion that Flurizan may, in many patients, actually halt disease progression over a 24-month time frame; the appearance that Flurizan slows the biological progression of the disease, and the extraordinary importance of this finding if replicated in the ongoing Phase 3 trials; the suggestion that there is a substantial benefit from Flurizan; the demonstration that not only did the population as a whole respond to the treatment, but a meaningful portion of the patients who responded to the drug did so by experiencing either zero decline after two years or a reversal of their decline to actual improvement; the efficacy of Flurizan against Alzheimer’s disease consistent with the understanding of Flurizan’s mechanism of action as a SALA; the Company’s belief that Flurizan is modifying the course of the underlying disease process; the appearance that Flurizan is modifying the underlying course of the disease process; the continued encouragement of the Company by the potential of Flurizan to treat mild Alzheimer’s disease; the anticipated completion of the Phase 3 trial, in order to confirm similar efficacy results for Flurizan in a larger population; the anticipated completion of enrollment of patients with mild Alzheimer’s disease in a global Phase 3 trial; and the belief that Flurizan is the most advanced drug candidate in a clinical trial that inhibits the production of Abeta42 to be evaluated in a clinical trial for the treatment of Alzheimer’s disease. These forward-looking statements are based on management’s current expectation and are subject to certain risks and uncertainties that could cause actual results to differ materially from those set forth or implied by forward-looking statements. These include, but are not limited to, uncertainties as to the extent of future government regulation of Myriad Genetics’ business; uncertainties as to whether Myriad Genetics and its collaborators will be successful in developing, and obtaining regulatory approval for, and commercial acceptance of, therapeutic compounds; the risk that markets will not exist for therapeutic compounds that Myriad Genetics develops or if such markets exist, that Myriad Genetics will not be able to sell compounds, which it develops, at acceptable prices; and the risk that the Company will not be able to sustain revenue growth for its predictive medicine business and products. These and other risks are discussed under the heading “Risk Factors” contained in Item 1A in our Annual Report on Form 10-K for the year ended June 30, 2006, which has been filed with the Securities and Exchange Commission, as well as any updates to those risk factors filed from time to time in our Quarterly Reports on Form 10-Q or Current Reports on Form 8-K. All information in this press release is as of the date of this release, and Myriad undertakes no duty to update this information unless required by law. Loneliness may put people at risk of an Alzheimer’s-like dementia, a study reported Monday. “People who described themselves as lonely were twice as likely to develop dementia,” says researcher Robert Wilson of the Rush University Medical Center in Chicago. Other studies have found that people who are unmarried and socially isolated are at higher risk for dementia, including Alzheimer’s. But this study is one of the first to show a link between loneliness — or the feelings of disconnection from other people — and a higher risk of developing dementia late in life, says Laurel Coleman, a spokeswoman for the Alzheimer’s Association and a geriatrician in Portland, Maine. Wilson and his colleagues studied 823 people who were about 80 years old and had no sign of dementia at the start of the study. The team gave the recruits a loneliness quiz and tested them annually for signs of memory loss and confusion, two key signs of dementia and Alzheimer’s. During the four-year study, 76 people developed an Alzheimer’s-like dementia, Wilson says. The risk of developing dementia increased about 51% for each one-point increase on the loneliness scale. People with the highest scores had 2.1 times the risk of developing dementia, a group of conditions that destroy brain cells and lead to mental confusion. Alzheimer’s is the most common form of dementia. Autopsies were performed on 90 people who died during the study. The researchers found no link between loneliness and the development of the abnormal brain deposits that are the hallmark of Alzheimer’s. That finding suggests loneliness might be triggering dementia through a novel mechanism — one that doesn’t lead to a brain riddled with deposits, Wilson says. One theory is that people who are lonely over long periods of time might have higher levels of damaging stress hormones. The elevated stress hormones might lead to an accelerated aging of the brain — and perhaps to dementia, Wilson says. Other research suggests lonely people are at risk of other health problems such as cancer and high blood pressure, says John Cacioppo of the University of Chicago. Still, he says, the new finding, which appears in February’s Archives of General Psychiatry, must be verified by additional research. The findings didn’t change much when the team factored in markers of social isolation, such as infrequent participation in social events. That means that people who have a small number of good friends might be better off than those with a busy social schedule but chronic feelings of loneliness, Wilson says. But lonely people often benefit from signing up for a new class or activity, Coleman says. Research shows that such activities might protect aging brain cells. And seniors who are out and about are more likely to make new friends, which might lessen feelings of loneliness, she says.